David Jimenez’s living room is one of my favorite spaces ever. I think it is very “me” because of the subdued colors, mixture of styles, and hints of glamour. 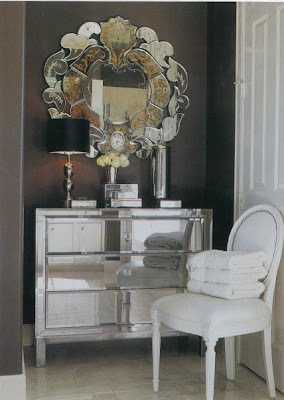 I think it encompasses my style the most out of any of the rooms featured in this post. I recently came across the most interesting topic on Decorum. If someone asked you to define your personal decorating style in three words, what would they be? This may be a no-brainer for some, but a challenge for others. Whether you know it or not, your sense of style is probably very well-defined, but if you are like me, it may be easier for your friends to come up with three words to define your style than it is for you to describe it yourself. Because I have a design blog and the type of personality that analyzes everything, it is hard for me to take my own home and say “this fits precisely in this category”, especially when my home is a work in progress. For that reason, I have gathered some of my absolute favorite pictures that are completely in line with my design sensibility. 1. I suppose the first word to describe my personal design style would be “glamour”. I hesitate to say that because I am not one of those people who believes their own hype and goes around thinking they are just “fabulous, dahling”. That is not who I am. I shop at Target! 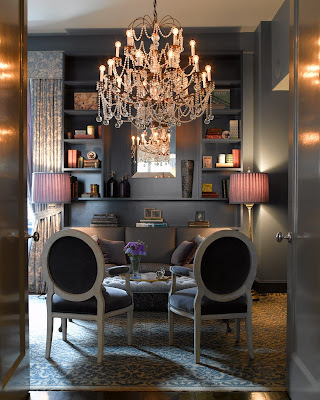 Despite the fact that I tend to like more masculine styles in décor, I do like hints of glamour here and there, especially when paired with a dark, subdued color, like in both of these rooms. 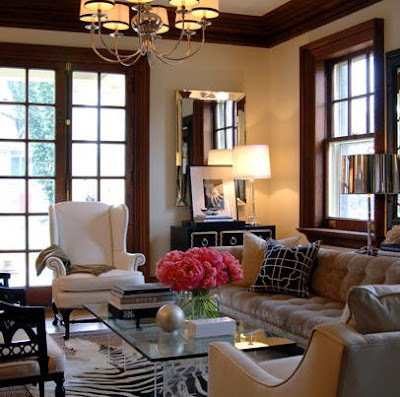 I love beautiful mirrors and chandeliers and believe in having beautiful lighting in every room. 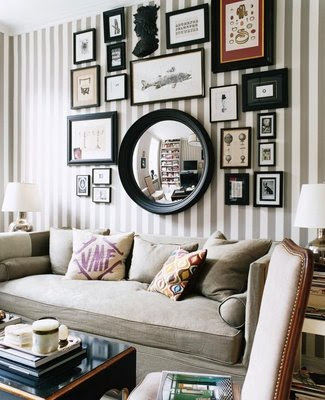 Molly Sims’ SoHo apartment is one of my favorite homes ever. 2. My second adjective would be “subdued”. I tend to choose neutrals for most furnishings and then build the overall look through accessories and textile like pillows. The subdued look really applies to the bedrooms and bathrooms in my home. I like white linens. I just love how crisp and clean they look. My bed has a a white duvet and pillows, but I add color through throw pillows. 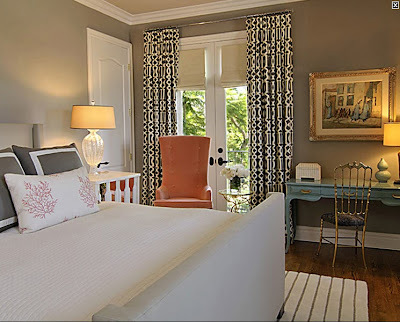 I love how both of the rooms pictured below feature very simple bedding, but incorporate color, texture, and patterns through the other elements in the room. 3. My last adjective would definitely be “eclectic”. I really love when a home looks and feels layered and collected. These rooms all feel very put together, but they feature a variety of design styles, as well as new and vintage or antique items. I think it is super important to have some vintage and antique items in your home in order to add character and personality. Otherwise, no matter how beautiful, rooms can look sterile if they resemble a showroom. I am constantly looking for ways to achieve this in my home. Katie Lee Joel’s gorgeous home is another personal favorite. I love Ron Marvin’s apartment. He packs so much style into that little space! I really like his use of neutral colors and the fact that he adds interest through patterns, like the zebra rug and pops of color through accessories. Given my husband’s profession and our love of lighting, I definitely see eye to eye with Ron, the self-professed “lamp tramp”. I also have an exciting announcement! Over the next few weeks, I will be featuring profiels of some of my favorite bloggers as they describe their personal style. They will be sharing their favorite room and describing how it personifies their personal design aesthetic. Look for the feature entitled “Personal Style” beginning early next week! Now, I would love to hear from you. What three words would you use to describe your personal design style? I love your three words and would have to add ‘French’ into the mix – because I seem to love all things French. Great post and I am looking forward to reading the upcoming profiles – such a fun idea, xv. Beautiful images. Exquisite taste. My design sensibility I have yet to see here but it has probably already been featured. I am just new to your blog. Minimalist, industrial with a touch of Asian. That chandelier in the SoHo home is incredible! All of those rooms are amazing. I LOVE David Jimenez’s style though. I would say my style is eclectic, colorful with hints of glamour. Love your style choices! Every one of these images has been saved to my computer as inspiration pics. No joke! We love your blog. It is so trendy and inspiring and the pictures are awesome. Would you be willing to guest blog for us? Do you ever write about lamp shades? How fun to choose just three words to describe your style. Seeing yours helped me figure out mine, and I think they would be: eclectic, feminine, and colorful. I also liked the personal descriptor, because I think character and story-telling are what make a room truly beautiful and inviting. From what I’ve seen on your blog, I think you explained your style prefectly. Love this post and the fact that it challenges me. I have always loved too many things – I am sure of what I like and don’t like – I just can’t define it as clearly as you did. Wow – three words? I am off to do my homework. Thanks for the great food for thought. Hill Country House Girl, thanks for your comment! Believe me, it took a while for me to really pinpoint three words to describe my aesthetic. Like you, I know what I like and don’t like, but I agree that it is difficult to choose the words to describe it. 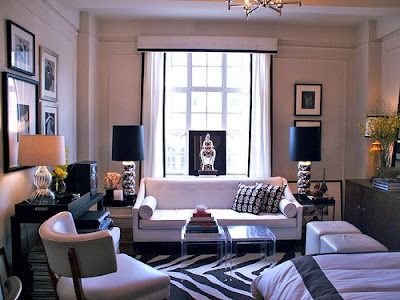 molly simms apartment is what spurred my love for design..I am doing that color on m walls next weeked!! *** One of my VERY FAVS of yours~~~~ there’s a “SPECIAL SOMETHING” about pure browns, taupes or one “sharp” color, mixed w/ crisp whites, that sooo SPEAKS to me!!! Just UBER-DELICIOUS!! !